REGION — Showers at state beaches are the latest casualties to water restriction mandates. 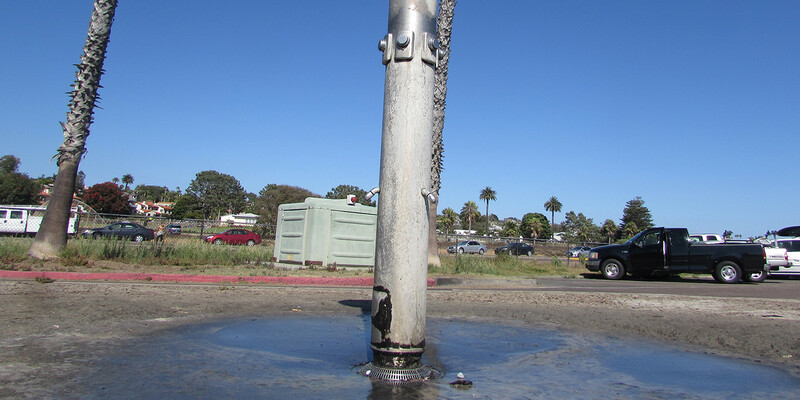 On July 7, the California Department of Parks and Recreation announced the outdoor showers at state beaches will be shut off, starting July 15. The department estimates the shut off will save 18 million gallons of water annually. Southern Division Chief of State Parks Brian Ketterer stressed they’re not tearing the showers out but are forced to take conservation measures where they can. Cities and counties are able to cut irrigation use on large swaths of grass although Ketterer said state parks aren’t able to easily cut back. “We don’t have (lawns) in our state parks. A lot of our state parks are very natural and open space and so we don’t do a whole lot of irrigation unless it’s for native vegetation or it’s for specific projects or historic landscapes,” Ketterer said. The state parks are responsible to local water authorities, as well as the state. The state beaches that are affected include San Elijo, Cardiff, Carlsbad, South Carlsbad, Torrey Pines, Silver Strand and San Onofre state beaches. The showers will be shut off until the drought subsides or the state mandates are lifted. The agency is required to cutback water use anywhere from 25 to 50 percent compared to 2013 water usage, depending on the local water agency. Each shower rinse uses 1.2 gallons. The state department is currently using more water now than it did in 2013, which Ketterer said is due to a rise in popularity of the parks, warm weather and good surf. “We have to get back at a minimum, to the 2013 levels and then reduce from there,” Ketterer said. More visitors are coming to the beaches because the ocean temperature has been warmer than average and the sand replenishment project, which took place two years ago, left wide-open sandy beaches. Finally, Ketterer said, the economy is bouncing back so more people can afford to travel to the beaches. State officials recommend beach visitors bring jugs of water or a bristle brush to scrub off sand and dirt. Michael Scrydloff said in the 25 years he’s surfed at Cardiff State Beach, he’s never seen the showers shut off. He said it’s somewhat frustrating to have paid for a park pass and not have access to the showers although he doesn’t mind adjusting. “I’ll just bring my own water,” said Scrydloff. Ketterer said that’s what he hopes for the rest of the beach visitors. “That’s basically what we’re asking people to do, make a personal decision in how you are going to use water,” Ketterer said. Ketterer said the department has already cut back water in other areas by increasing leak detection and leak repair projects, and reducing the water used for construction and restoration projects and housekeeping. “We’re at the point now that we have to start looking at the amenities that we’re providing to the public and unfortunately, that’s the next phase that we’re going into, should the drought continue,” Ketterer said.